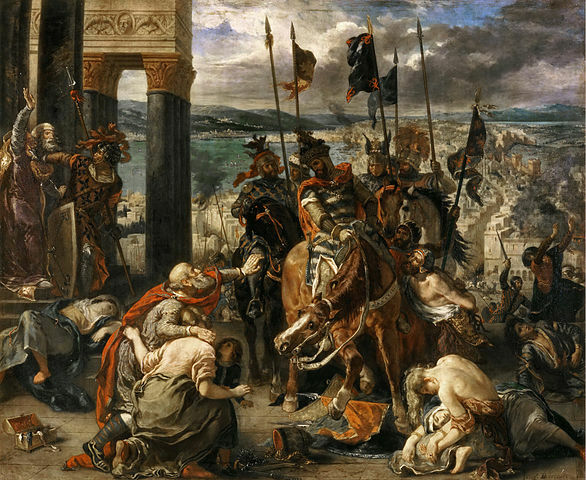 How did the sacking of Constantinople in 1204 lead to the creation of the World Wide Web? At the beginning of the 13th century, the Byzantine empire was one of the most powerful in the world. Until, that is, the Fourth Crusade was diverted from the Holy Land to attack and capture Constantinople. Whilst that in itself led to a huge global power shift, a seemingly somewhat irrelevant event at the time would go on to have an arguably equally significant effect on the history of the world. In the wake of the fall of Constantinople, a small group of glassmakers fled Turkey. Crossing the Mediterranean, they ended up in Venice – then the most important trading hub in the world – where they continued their trade, bringing additional wealth to the city. However, producing glass required furnaces operating at extremely high temperatures, which for a city built of wood posed an unacceptable level of risk of the neighbourhoods in which the glassmakers had set up shop being burned to the ground. So, in 1291 the city government decided that the glassmakers could no longer stay in the city. They were moved just a short journey across the lagoon to the island of Murano. The island is tiny in comparison to Venice itself – the size of a small neighbourhood. The result of the move was to create an ‘innovation hub’. The glassmakers were now rubbing shoulders with each other, and whilst on the surface they were competing for trade, the sheer density of the population meant that new ideas were spread and adopted quickly. By the beginning of the 14th century Murano had become known as the Isle of Glass, and even today Murano glass is world renowned for its beauty and quality (it even has its own trademark). The sharing of knowledge by these glassmakers accelerated the development of glass far more rapidly than would otherwise have been the case. The glassmakers of Murano would go on to develop clear glass and mirrors. Their pioneering work with glass would ultimately lead to the invention of telescopes, microscopes and fibre optics – the very material from which the World Wide Web was created. Steven Johnson’s book, quoted above, is full of fascinating stories such as this one. The extent to which coincidence, luck, being in the right place at the right time has shaped our world is almost impossible to comprehend. With almost every new invention, those around at the time can have had no clue as to what effect such an invention might have on future generations. In the world of investing, many people are constantly searching for the next Apple, the next Amazon, the next new, new thing. But realistically, how can we possibly know today which companies will not only still be around in the future, but will produce the new, new thing that changes the world? We can’t. A recent study found that in 1965, the average tenure of a company in the S&P 500 was 33 years. By 1990 that had dropped to 20 years. It’s now 14 years. The study forecasts that, at current rates, 50% of the companies currently in the index will be replaced within the next 10 years. In GBP. Source: MSCI developed markets country indices (net dividends). MSCI data © MSCI 2017, all rights reserved. Indices are not available for direct investment. Index performance does not reflect expenses associated with the management of an actual portfolio. 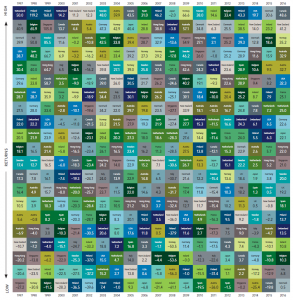 The above table illustrates just how random returns have been. In the period covered, no country had the best performing market more than two years on the trot. Only two managed to be top for two years running and I’d be willing to bet few people would have chosen Finland and New Zealand as being those countries ahead of time. I could go on (and on), but hopefully you get my point. And technology advances at such a rapid pace nowadays it’s virtually guaranteed that many of the inventions of the last 50 years will be superseded far faster than earlier inventions were. The above advances didn’t all happen in one country. Who knows where the inventions of the future will originate? Despite its detractors, globalisation is a thing, and I don’t see that changing. As emerging countries continue to develop, innovations of the future could come from virtually anywhere on the globe. Which is why a low-cost, globally diversified portfolio increases your chances of having a successful investing experience. The alternative – taking bets on your home country, or a small sub-set of global markets – increases your risk and decreases your investment opportunities.